a) Articles written in Turkish will be published in the Conference Book. b) Articles written in English or German will be published in a special issue by an international publication house. c) Articles written in Turkish, English or German will be published in International journal of social and humanities sciences(http://dergipark.gov.tr/ijshs). 1- Articles should flow with a smooth transition from one paragraph to the next. The papers submitted for the conference are required to meet the criteria to be accepted for publication in the conference proceedings. 2- Papers which are not approved by the scientific committee will not be published in the conference proceedings. 3- Each paper can only be published in one issue. 4- Professors who have not submitted their abstracts will not demand the right of publication in the abstract book. 5- The maximum page numbers are 15 for full papers. Please make sure that papers should include the rules of spelling Apr 6.0 Ape 6.0 Orthography and Citations Format . 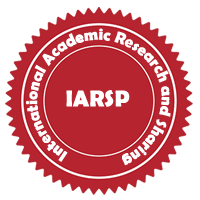 Papers should be sent to info@iarsp.org until May 24, 2019. 6- The articles submitted for presentation / publication at our conference must not have been submitted / published elsewhere . It is assumed that this rule has been accepted by all authors. In case this rule is disobeyed, the conference committee reserves its legal rights to the relevant author(s). In the event of any negligence that may arise, all material and moral responsibility shall be with the respective author(s) concerned..